Sorry about the lack of recent posts. I’ve been spending precious time with these two Thai men below, the little one has kept me especially busy. Yesterday was his one month birthday! We celebrated over Pumpkin Pie and Texas Au Lait ice cream from Lick, an ice cream shop in Austin, TX that uses only local, seasonal ingredients. Dom said I should have given them some of my milk, which is a local ingredient, so they could make some ice cream for Rocco. I decided against that, but Rocco was a little jealous that he couldn’t have any, yet he got over it quickly. Now onto what you have been waiting for, Thai Ginger Chicken. The closest I had ever gotten to ginger before Thailand was sipping ginger ale—something I always request on every flight I go on, and usually don’t drink elsewhere. Anyone else have any flying quirks like me? I loved the taste of ginger ale, but before Thailand I never thought of eating it. Oh how things have changed. Ginger now always hangs out on our kitchen counter, waiting to be peeled and chopped and thrown into our warm wok. I can’t imagine life without it now. Ginger has a kick to it—not the same power as a Thai chili pepper’s—but it wakes up your sinuses in a similar way that wasabi does, but not as intense. 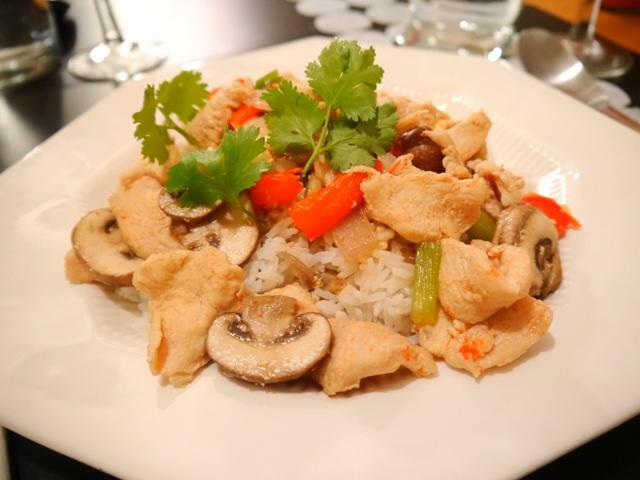 And one Thai dish in which ginger is the star of the show is Gai Pad King, Thai Ginger Chicken. Whenever I’m chopping the ginger for this dish, or any dish with it, I peel and chop a huge mound of it and put down my knife. Dom always looks at the mound and sweetly says, “Can you use more ginger please?” He can never get enough of it, and neither can I. 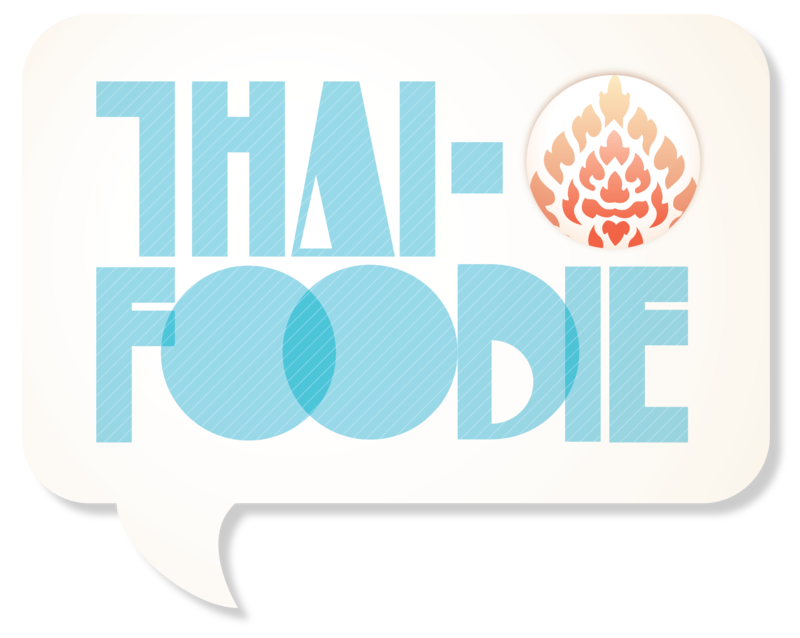 We have Thai tongues that like to tingle, but if you don’t, feel free to use less ginger to your tongue’s satisfaction. And on a side note, I have found a new ginger ale that is made with real ginger that I love to drink anytime, even when not flying. 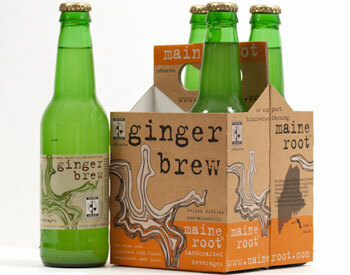 It makes my taste buds wake up and smile with every sip—Maine Root Ginger Brew. Do you love ginger? Your taste buds will rejoice once you savor the spicy kick of Thai Ginger Chicken! Warm cooking oil of your choice in your wok or pan. Add garlic, white onion, and red bell pepper and stir until fragrant. Add chicken to wok and add about a tablespoon of fish sauce and a tablespoon of oyster sauce. Stir until chicken is no longer pink. Throw in mushrooms and green onion along with the ginger, the rest of the sauces, sugar, and chili paste. Add a tablespoon or teaspoon of the sauces at at time until you reach your desired flavor. Cook until mushrooms are soft. Sprinkle with cilantro when you serve it. Enjoy! If you want less of a ginger kick, use only about 1/2 cup of ginger. Feel free to use less fish sauce and add in some Thai soy sauce if you have it. Rocco is adorable! Congratulations 🙂 Also I just went to Lick a couple weeks ago… SO good. Thanks Natalie! We are in love with him! Glad you agree about Lick! So delicious! I hugely enjoyed this recipe! It was pretty easy, and I loved all the flavor! The ginger gave it an awesome kick! Thanks so much Sherri for this! I’m glad the recipe was easy! I love ginger too!! I’ve made the gai pad king 2x already. It is fabulous and so, so, so, delicious. Thank you so much for this recipe! Meet Sherri, a girl from NC who fell head over heels in love—with Thai food, a Thai man and Thai cooking.